Photo: Original Mark EwingLast month, I reviewed the Wavestation component of the Korg Legacy Collection, and found it to be an excellent recreation of the original synths. In many ways, this isn't surprising, because it shouldn't be too difficult to duplicate the function and sound of a 'vintage' digital synth in a new digital form. But what of the other components of the Collection, MS20 and Polysix? Can Korg recreate their success when called upon to model the distinctive sounds and vagaries of two of its most famous analogue synths? This month, it's Legacy MS20 's turn for a thorough examination. As I described last month, loading and authorising Legacy Collection is straightforward, although for indefinite use it requires that you obtain a licence number from Korg's web site. 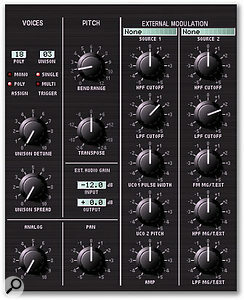 Once you have done so, you can use Legacy MS20 as a stand-alone program, or as a VST or AU plug-in. You can also use it within the Legacy Cell environment, which we will look at next month. The MS20iC controller connects to your computer (and draws its power) via a USB cable. If, like me, you're connecting it to a Mac, you need do no more; the controller will be recognised by the OS X Audio MIDI Setup software. Windows XP users, on the other hand, will need to log on as administrators, and perform a 10-step procedure to install the Korg USB MIDI driver. Although somewhat smaller than a vintage MS20 (it's an 84-percent scale recreation, apparently), the MS20iC hardware controller is an exact recreation of the original synth, with one major exception: the sockets are merely physical representations of the software patching in Legacy MS20. 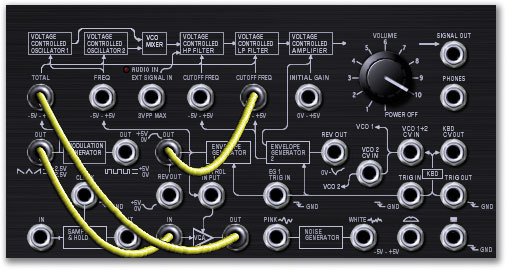 In other words, the front-panel patch points are not real CV connections, and you should not attempt to input control voltages from other synths. The program offers two modes, 'Play View' and 'Edit View'. These are somewhat loosely named, though, because you can play in Edit View and edit in Play View, and both views display the parameter values when you hover over the knobs. 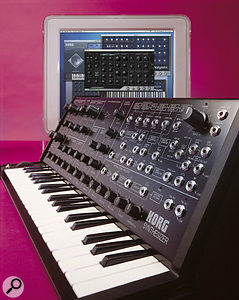 However, Play View shows only the front-panel controls that were present on the original synth, while Edit View shows all the additional facilities available. Korg make a big deal of the physical modelling used to recreate the MS20. They call this 'CMT', which stands for Component Modelling Technology, and claim the following: "CMT takes an organic approach to modelling, duplicating the circuit path of a synthesizer by recreating each individual component — transistor, capacitor, resistor, etc. CMT's cloning of the entire instrument ensures that every nuance is replicated." I have doubts about this — specifically about the suggestion that the software synth is constructed in a single operation from models of individual components. Certainly, there is software that does what Korg claim; it's used by circuit designers to 'prototype' boards without having to build them. However, the processing requirements are considerable, and modelling even uncomplicated analogue circuitry remains, even on today's computers, an off-line, non-real-time process. The Macs and PCs on which the Legacy Collection runs do not offer sufficient power to model every component in a synthesizer individually in real time in this way. It might be possible if CMT was a 'linear' representation that ignored all the non-linear responses of the circuits, but this would generate a very sterile sound, not at all similar to the original synth. For this reason, I feel that Korg's description of CMT was probably invented by their marketing department, not their engineers. If this is the case, I can't imagine why; no matter how Korg have achieved it, the recreation of the MS20 is impressive enough not to need such 'help'. Korg made some interesting choices when designing the MS20's oscillators. Firstly, they chose different ranges for the two, with VCO1 offering 32', 16', 8' and 4' options, while VCO2 was offset to 16', 8', 4' and 2', with a fine-tuning control offering a range of ±12 semitones. Secondly, they gave both different waveforms, with VCO1 providing triangle, sawtooth, a variable-width pulse and white noise, and VCO2 offering sawtooth, square, a tight pulse with a duty cycle of less than 10 percent, and a so-called ring modulator. Legacy MS20 in its entirety. As expected, Korg have reproduced this configuration on Legacy MS20, so I would like to compliment the company's engineers on their willingness to recreate the original synth without modifications. 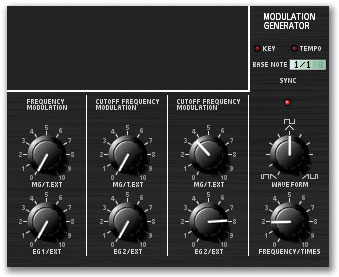 It must have been tempting to add the MS10's pulse-width modulation to VCO1, or to add oscillator sync, but they didn't, and decisions like this make the emulation far more accurate and eccentric than it might otherwise have been. Legacy MS20's oscillator section.I started by testing the triangle waves produced by the two synths. Sonically, the results were similar, although it was not hard to differentiate one from the other. Legacy MS20 's triangle wave is a tad brighter than the original MS20's, sounds less 'hollow', and lacks some of the apparent 'bottom end'. This was not simply a matter of EQ. I tried to equalise the character of one to match the other, but couldn't, so I decided to measure the outputs using an analyser. I discovered that the waveforms are similar, but not identical. 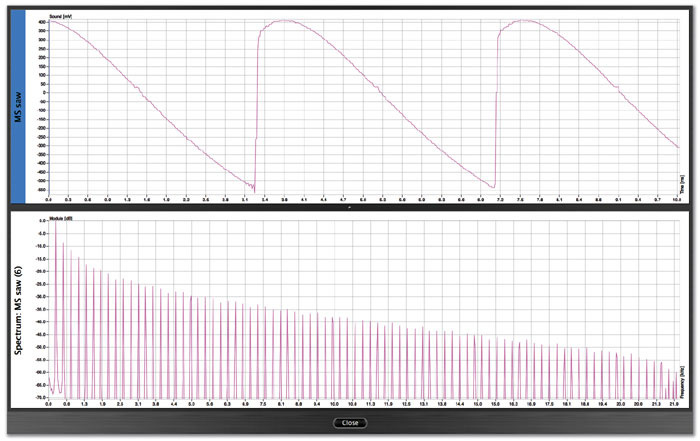 Indeed, the spectrums of the two waves are markedly different; Legacy MS20 has stronger mid- and high- frequency components, while the original MS20 demonstrates stronger alternate harmonics. Moving on, Legacy MS20 's sawtooth wave sounds fuller than the original MS20's rather rounded waveform, with the original synth being much the buzzier of the two. The magnitude of this difference is clearly visible in the graph plots shown on the next page. Likewise, the square waves and pulse waves exhibit significant differences between the emulation and the original. It is, therefore, remarkable how similar the two synths sound, although Legacy MS20 's square wave is clearly the more 'hollow' of the two, and its pulse wave is somewhat louder at high pitches. Next, we come to the device that Korg called a ring modulator, but isn't. This accepts the pulse wave from VCO1 (no matter which waveform you select on the panel) and the square wave from VCO2, and passes them through a device called an XOR gate. This treats the waveforms as '1's and '0's, and creates a new waveform that has some of the characteristics of a ring-modulated signal. The limitations of this approach are manifold: you can't use any other waveforms, you can't modulate external signals, and you can't use the modulator as a VCA. 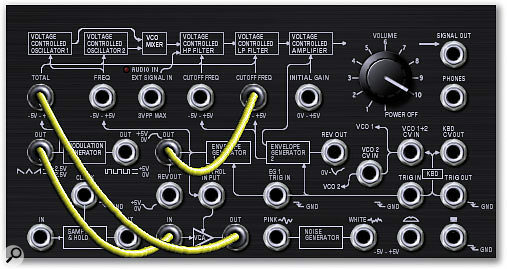 On the other hand, this 'logic' modulator is very cheap, and has a distinctive, harsh sound that many people like. What's more, the programming required to emulate a gate is straightforward, so it comes as no surprise to find that Legacy MS20 's 'ring modulator' is indistinguishable from the original's. The final controls in the oscillator section are simple ones: VCO1 and VCO2 Level controls, Portamento Time, and Master Tune. To sum up the oscillators, it's fair to say that there are significant variations in the The MS20's sawtooth wave.waveforms and spectrums generated by the emulated and the original MS20. However, the sonic similarities are far greater than the differences, and it would be difficult to quantify them without making a direct A/B comparison. 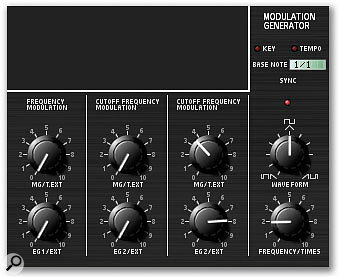 Considered thin, weedy and uninteresting in 1978, the MS20's filters have since become icons in analogue synthesis, spawning an industry of blatant copies and thinly disguised imitations. On the surface, there's nothing special about them; they're simply a pair of resonant high-pass and low-pass 12dB-per-octave filters, which will oscillate if the Peak (resonance) exceeds a certain value. But in the late 1980s, when the world rediscovered the squelchy sounds of the Roland TB303, a new dawn for the MS20 was not far behind. 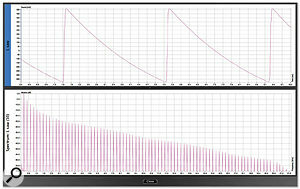 Legacy MS20's sawtooth wave.My measurements show that the lowest cutoff frequency for both of the MS20's filters is 26Hz. 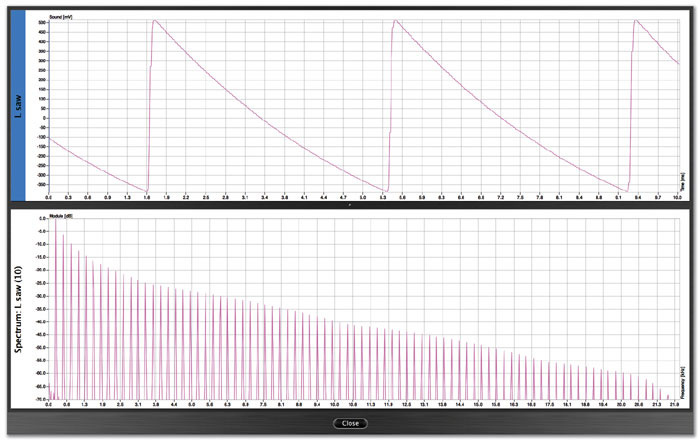 The maximum values are 17.2kHz for the low-pass filter, and 17.1kHz for the high-pass filter. This is not a bad range, but Legacy MS20 puts it to shame, with both filters ranging from 14Hz at the low end to 21kHz at the upper. These differences may not seem huge, but the low frequency extension is almost a full octave, which is very significant because the high-pass filter does not have a 'hard-knee' response, and so attenuates signals well above the notional cutoff frequency. Consequently, bass sounds are deeper on the software MS20 than they are on the original. Similarly, a low-pass filter with an upper frequency of 21kHz is going to pass more of the high-frequency components, and will sound both crisper and brighter. The result is a synth that can sound slightly richer and crisper, or less fizzy, depending upon your point of view. Ignoring the extended range, Legacy MS20 must still imitate the original's distinctive filter characteristics if it is to sound genuine. 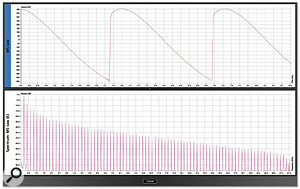 For example, the MS20's self-oscillation is not a sine wave; the waveform has numerous harmonics, and a distinctive character. Legacy MS20 recreates this extremely accurately. Likewise, if you make the MS20's low-pass filter self-oscillate and then add some oscillator output at a lower, unrelated pitch, you do not obtain two clean pitches: the result is distorted. Legacy MS20 recreates this well, and although it is possible to distinguish it from my hardware MS20, I would be hard-pressed to tell you which was which in a blind test. Another trick with the original MS20 involved placing either filter on the edge of self-oscillation and mixing the oscillators at or near maximum level. If you then backed off the oscillators' volumes, the filter would begin to oscillate. Again, this is imitated with remarkable accuracy. The envelope generators.The envelope generators on the MS20 are not ADSRs, nor are they ARs, ADSDs, or any of the other configurations that were common in 1978. One is an HADSR (an ADSR with a Gate Hold) and the other is a DAR (an AR generator with an initial Delay stage). Let's deal first with EG2. Hard-wired to the VCA, this generates the contour that you would expect. However, when you use it to sweep the filter, changing the Sustain Level seems to have no effect on the filter cutoff frequency. Well, that's not quite true. It has a brief effect, but then the filter settles back to its previous cutoff frequency. What's happening is this... EG2's sustain level is always set to be 0V at the filter's input, and therefore does not affect the cutoff frequency. This means that, when modulated by EG2, the cutoff frequency starts below where the cutoff frequency would be if not affected by the envelope, rises above this point in the Attack phase, then drops back down to 0V in the Decay phase, in time for the Sustain phase. When you release the key (or when the Hold time is completed) the cutoff drops at a rate determined by the Release to where it started. Consequently, the Sustain Level control determines the height and depth of the frequency shifts in the Attack, Decay and Release stages. Aside from a couple of rare Yamaha synths, I'm not aware of any other manufacturer implementing a filter contour in this way, and it is one of the oddities that sets the MS20 apart from the crowd. Happily, Korg have recreated it correctly on the Legacy MS20. What is not identical, however, is the calibration of the envelope times; the slowest Attack on my MS20 is much slower than that on the software version, although the Decay and Release are much the same. EG1, although the less flexible of the two, offers four stages: Delay, Attack, Sustain (at the maximum level), and Release. This acts almost identically on the two instruments, so we need say no more about it. To the left of the original MS20's envelopes lies a simple Modulation Generator that offers just two controls: frequency and wave shape. Two basic waveforms are available: pulse, with widths ranging from 0 percent to 100 percent, and sawtooth/triangle/ramp. These are recreated on the Legacy's MS20iC, but the software also adds LFO MIDI sync. When this is switched on, the LFO is synchronised to the tempo of incoming MIDI Clock, the tempo of the host application, or the Tempo in Legacy Cell, depending upon the way in which you're using the program. You determine the association between the external clock and the LFO rate by setting a combination of the Base Note relationship (which varies from 1:1 and 1:32, including triplet steps) and the Frequency/Times knob, which multiplies from one to 16 the number of clock pulses needed to complete a single LFO cycle. It's a simple system, and it works well. Legacy MS20 has a simple patch save/load system, accessed either via a menu or via the Prog List screen. Firstly, you can rename and write the current patch to any of the 32 locations in the memory bank. Next, you can save a single patch to disk (although this file will not contain the Configuration parameters — see page 190) or save the whole bank. When you wish to load patches, you can reload single patches or complete banks. It couldn't be simpler. For many players, the MS20 patch panel is little more than a modulation controller, allowing you to select and modify a wider range of sources and route them to the destinations of your choice. Sure, it offers an S&H module, but it has no mixers, no multiples, and just a single patchable VCA, which means that you will only get the best from an MS20 by combining it with other modular equipment. Unfortunately, Legacy MS20 does not allow this, so you are limited to using it as a stand-alone instrument. Operationally, I particularly liked the fact that physical patching on the MS20iC controller is echoed on screen so that, when you save and recall patches, you can see exactly what's going on. With 10 physical cables provided, you should have enough for any patch, but even if you run out, you can continue to make connections on-screen by dragging virtual cables from one socket to another. The software does not preclude 'wrong' connections, including the naughty but nice trick of feeding the output from the headphone socket into the Ext Signal In jack. It's just a shame that on-screen patching is not echoed by the magical appearance of a patch lead on the MS20iC controller! Pleasingly, almost everything on the software version seems to work as on the original, including the unusual 'Track and Hold' behaviour of the mis-named Sample and Hold module (for more on this, see the Synth Secrets August 2000. The same — for better or worse — is also true of the External Signal Processor, or ESP. When I bought my first MS20 in 1978, I tried everything to get the ESP to act as a monophonic guitar synth. I experimented endlessly with signal levels, external filtering and compression, and with the band-pass filtering within the ESP itself but, try as I might, the best I could obtain was a glitchy noise that refused to track correctly. In this respect, Legacy MS20 's ESP — whether running in stand-alone mode or as a plug-in — is no different from the original MS20's. The ESP works like this. If you're running Legacy MS20 as a stand-alone program, any audio presented to the computer's audio input is directed to the Signal In socket of the ESP. Once the ESP is receiving audio — and the key here is to discover that you must switch it on by clicking on the Audio In legend — you can set the signal level, and use the band-pass filter to isolate the range of fundamental frequencies (if you do not do this, the ESP may try to track harmonics, which is one source of glitching). You can then take the output from the frequency-to-voltage converter, using this as a CV to control other parts of the synthesizer, and the output from the Envelope Follower and trigger generator (which is actually a Gate generator) to do likewise. In practice, this works exactly as it did on the original ESP. In particular, you'll discover that it remains impossible to use the derived CV as an even-tempered pitch CV, no matter how you adjust the CV Adjust within the ESP itself, or the Ext knobs in the modulation section. No change there, then — but of course you can use the CV to control parameters other than just pitch, and at least the emulation remains faithful to the original, warts and all. The External Signal Processor, or ESP. The MS20iC is lovely, and I particularly like the fact that when you switch it off and on again the program and the Edit screen jump to the physical values of its knobs and inserted cables. Unfortunately, the quantisation of its knobs is too coarse for careful programming. To obtain precise adjustments, you must use the Shift key and mouse to change parameters on screen; programming in this fashion offers much finer control. This method allows you to program an Osc2 detune of 0.02, which results in a rich, slow 'chorusing' between the oscillators. 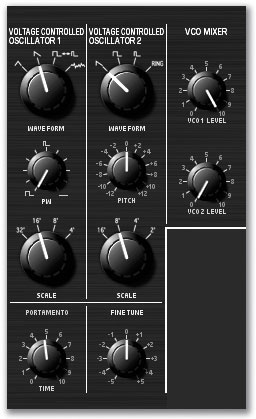 In contrast, the smallest division available from the MS20iC's front panel is 0.19, which is far too great to create this effect. If you're using Legacy MS20 as a plug-in rather than as a stand-alone software synth, you'll notice that a second program appears in the effects list of your host application. Called MS20FX, this has all the facilities of the MS20 software plus stereo inputs from within the host application (note, however, that MS20FX is unable to process audio presented to the computer's audio inputs). The stereo inputs connect to the Ext Signal In sockets in both the main patch panel and the ESP, so you can use MS20FX to apply filter and amplitude modulation to the sounds of other computer-based instruments and/or use (or attempt to use...) the ESP to derive pitch and amplitude information from their signals. The benefit of this becomes apparent when you experiment with the 32 MS20FX patches (or Templates) supplied by Korg. I have owned an MS20 for 26 years, but I still hadn't tried some of these, especially the trick of overdriving the ESP for some excellent distortion effects. Thank you, Mr Programmer! Using Legacy MS20 and MS20FX is a doddle for anyone who has experience of the original MS20, and for anyone prepared to read the comprehensive (but not overly long) documentation. Of particular benefit for novices are the original MS20 manual and patch charts, both of which are provided on CD-ROM in PDF format — a nice touch. As you can see in the screenshot above, Legacy MS20 's 'Edit' screen possesses seven sets of controls not found on the original MS20, and these extend Legacy MS20 's capabilities way beyond what was possible on the hardware MS20 back in 1978. The first of these (Voices) allows you to determine the polyphony, and how many voices will be overlaid in Unison. The former accepts figures from one to 32, and the latter from one to 16, meaning that polyphony can be as high as 32 voices, or as low as one, with up to 16 voices under each note. In addition to this, there are the Mono and Poly assignments, the former of which overrides the numeric Poly setting and allocates the total polyphony to a single key whether or not Unison is greater than '1', and Single/Multi triggering, which refer only to monophonic modes. Underneath these, you'll find the Unison detune and spread knobs which, as you would expect, determine the amount by which the pitches of the unison voices are detuned and spread across the stereo field. Unfortunately, there is nowhere to set the key priority. The original MS20 used single triggering and high-note priority, but Legacy MS20 has last-note priority, so there is no way to get the software to replicate the playing style of the original synth. You also have to be careful of the interaction of these six controls, because they can lead to at least one unexpected result. If you set the polyphony to be greater than '1', the voice mode to Mono, and the Detune and Spread to '0', you'll find that the tone of your patches changes when you change the polyphony. At first, I thought that this was a fault, but it isn't. Given that the software is emulating an analogue synth, the voices are not identical, but they are so close that, with no detune or spread, you obtain phase cancellation. Every time you change the amount of polyphony, you are changing the nature of the cancelling, and thereby the tone. So beware. You must also pay attention to the amount of power demanded by higher polyphony and unison settings. Like Legacy Wavestation, Legacy MS20 is a power-guzzler and, if you're not careful, you're going to exceed your CPU's capabilities. I found that, depending upon the nature of the patch, I could typically get as high as 18 voices before the sounds started to glitch, or acquired a grungy quality. This is quite low, particularly when unison is '2' or higher, but the consequence of setting the polyphony even lower is note stealing. If you want to stop the computer maxing out, you can set a CPU loading threshold that, if exceeded, will cause the MS20 to stop producing audio. This means that there will be no nasty digital noise if the processor overloads. The next panel has just one control, marked 'Analog'. This adds a random CV variation to the pitch and filter cutoff frequencies every time you press a key. Some people will like this, but I found it most pleasing when set to zero. I've not noticed random tuning errors on my vintage MS20, and I don't see that I should insert some where none previously existed. The extra controls in Edit view. Alongside this, you'll find a pan-pot that affects the relative loudness of the left and right channels in the final output and, above this, the Pitch section which determines the pitch-bend range (using a MIDI pitch-bend wheel, joystick or whatever, not the MS20's wheel) and a global transpose of ±24 semitones. Between these, the Ext Audio Gain settings allow you to set the input and output gains of the ESP. The final two additions are very important, because they allow you to control the synth using your choice of two MIDI controllers from a list of eight: key velocity, pressure, pitch-bend, mod wheel, breath controller or MIDI MIDI continuous controller (or CC) numbers 16 or 17. Source 1 offers five destinations (the filter cutoff frequencies, VCO1 pulse width, VCO2 pitch and audio VCA gain), while Source 2 offers a different set: the filter cutoff frequencies (again), FM depth, high-pass filter modulation depth, and low-pass filter modulation depth. Independent bi-polar knobs determine the depth of the effect at each destination, so although the number of controllers and destinations seems somewhat limited by modern standards, the amount of control available is considerable. What's more, you can remap the source controllers to CC numbers of your choice from #1 to #95. You do this in Configuration view, which is also where you determine the polarities of the MIDI CCs, the master tuning, the temperament (equal, pure major, pure minor, or any one of 13 User scales) and set the MIDI filters on or off. However, be warned that these settings are lost each time you close the program, unless you save them in an FXB bank. Again like Legacy Wavestation, Legacy MS20 has no SysEx capabilities, but its MIDI capabilities are still extensive. Most obviously, you can assign new MIDI CCs to any of the knobs and switches on the front panel. The simplest way to do this is to hold down the right-hand mouse button (on a PC) or the Ctrl key (on a Mac) and click on the control of your choice. You can then assign any MIDI CC number from a drop-down list, or tell the parameter to 'learn' the next incoming CC. However, if you change the CC assignments in the software, there will no longer be a correspondence between the control legending on the MS20iC, and the effect of these controls on screen. If you are courageous enough to change any assignments, you can save the new controller map using a menu hidden behind the Korg logo. This saves and loads maps, allows you to display all the assigned CCs, and provides a clipboard to cut and paste patches from one memory to another. Number of patch points: 27 plus signal and headphone output. Formats: Audio Units (AU), VST, or stand-alone (no MAS). Legacy Collection minimum computer requirements: 1.5GHz Pentium 4, 1.3GHz Centrino, Athlon XP/2000+, or 1.8GHz Celeron-based PC running Windows XP Home or Professional Edition with 256MB of RAM (512MB recommended), or 800MHz G4 Apple Macintosh running Mac OS 10.2.6, with 256MB of RAM (1.25GHz G4 with 512MB of RAM recommended). Like many software synths, Legacy MS20 offers an on-screen keyboard, which is useful as a test-bed when creating new sounds, but is pretty much useless for anything else. Likewise, although the MS20iC points the way forward for all 'soft' instruments, its 37-key mini-keyboard lacks cop for serious players. It is velocity sensitive, but it's also spongy, and feels to me like a procession of black and white springs. That's a great shame, and I would be prepared to see the package cost a little more and include a full-size recreation with a proper keyboard. Then you could program sounds from the hardware controls and play from the full-size, velocity- and pressure-sensitive MIDI keyboard, all on one unit... now that would be something! But what I really like about Legacy MS20 is its polyphony. Back in the 1970s, a handful of manufacturers tried to manufacture polyphonic versions of their monosynths, but it wasn't until recently that software synths demonstrated what it would be like to hear genuine, polyphonic versions of revered monophonic instruments. The results can be stunning. Increase the polyphony, add Unison, spread and detune, add suitable effects and... oh wow! Rich ensemble strings, huge cathedral organs, and all manner of pads, brass, and other traditional polysynth sounds just pour forth. Of course, there are some sounds for which the MS20's architecture is not best suited. For example, the lack of oscillator sync makes the synthesis of acoustic and electric pianos difficult. But I was still amazed by the quality of sounds I was obtaining quickly and easily. As for non-imitative sounds and effects, a polyphonic MS20 is a dream. 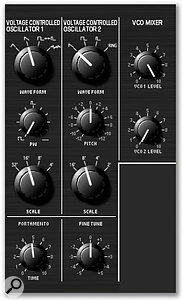 Oh yes, and the MS20FX incarnation deserves another mention, because the results of playing other software synths through it can be quite remarkable. Turning to sounds I don't often use, I discovered that a polyphonic MS20 is also a dance musician's dream, at various times producing the bass, stabs and percussion effects that are so useful in these genres. However, this was also where I discovered a significant shortcoming... Attempting to launch multiple instances of the stand-alone Legacy MS20, I realised that there was no way to allocate each to a single MIDI channel. In other words, the stand-alone program is always in Omni Mode. Bah! The only other problems I encountered occurred when using the package as a VST plug-in. Firstly, it had a tendency to produce stuck notes when the polyphony/unison was high and I played fast runs. This did not occur in stand-alone mode, so I suspect that it may have been a problem in my chosen VST host. 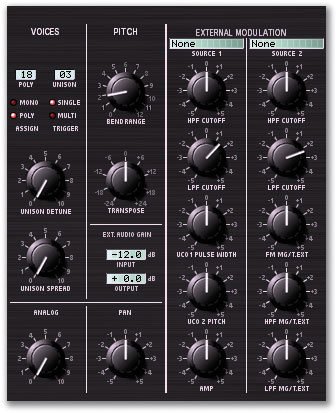 Likewise, the VST version did not recognise patch cables when I inserted or removed them from the MS20iC. I could still use 'virtual' cables on screen, and everything worked correctly, so again, this may have been down to a problem with my host package. But to place this in context, it's worth noting that, while it's impossible to test every possible situation, I put the MS20 and MS20FX through some very stiff tests and they steadfastly refused to crash. This reflects very well on Korg, especially since I was using v1.0.0. Korg have done an excellent job duplicating the timbre and response of the vintage MS20, recreating many of its subtleties with remarkable success. Indeed, the sound is close enough to fool anybody without the opportunity for a direct A/B comparison. Sure, some patches are not exactly the same, perhaps because Legacy MS20 is somewhat better-behaved than my 26-year-old bunch of circuits, but the differences are perhaps no more than you might expect had Korg built a new, analogue MS20 and placed it alongside the original. Bearing in mind that there were also two hardware versions of the original, and that these are reputed to sound slightly different from one another, the differences between Legacy MS20 and my 'Blackboard' MS20 become even less significant. Inevitably, the feeling of déjà vu is particularly evident when you use the MS20iC, but its importance is even greater than that. By including a dedicated hardware controller, Korg have made Legacy MS20 genuinely desirable for reasons other than cost or convenience. As for the cost... at £399, the Legacy Collection is stunning value. Had Korg released just MS20, MS20FX, and the MS20iC for the same price, it would still not have been overly expensive. So, what's the catch? To be honest, there isn't one. The MS20 has more than enough character to deserve recognition as one of the important synthesizers of the 1970s, and if you're after a straight recreation of this, you'll be very happy. If you're hoping that sensible enhancements will extend the MS20's usefulness, you'll be more than very happy. Even if you're not a fan of the original synth, you'll be impressed. It's a winner. An excellent recreation of the sound and feel of the MS20. It's even better as a polysynth. The MS20iC has the 'wow' factor. The documentation is clear and comprehensive. Neither MS20 nor MS20FX crashed in a month of testing. The Edit View window is too narrow, and unadjustable. There's no MIDI channel selection — the stand-alone version is always in Omni Mode. It's power-hungry, so polyphony is relatively low. Not only does the Legacy MS20 software recreate a much-loved monosynth, it extends it in very useful ways that in no way detract from the character of the original. Together with the MS20FX software and MS20iC hardware controller, it is an imitative software synth of almost unparalleled desirability.